By Community Chickens on April 28, 2013 Visit Community's Website. Our Black Spanish turkey hens have started laying. Every couple days I’m greeted with a few random eggs scattered in different parts of the floor of the turkey house. Only recently have they decided on a community spot and started laying in one corner of the coop. I’m hoping that this is a sign that perhaps one of our hens will decide to sit on the clutch and hatch out some poults for us. If no one gets the broody bug, then I will dig out the incubator and fire it up. 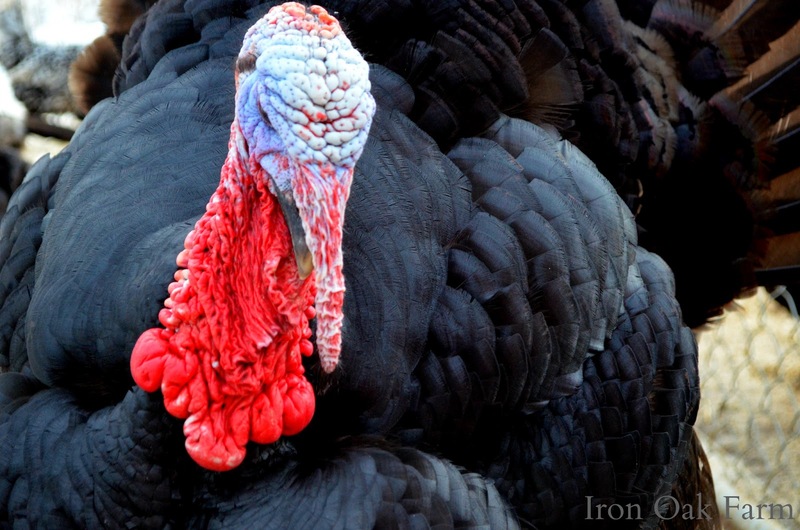 This year’s turkey poults will be the mark of a full circle with our Black Spanish flock. I’ve really enjoyed raising turkeys. They are beautiful birds, with wonderful personalities, habits and oddities. I love the noises they make, the dances, the strange gestures…not to mention the most delicious meat I’ve ever tasted! I just cooked the last turkey in our freezer from our fall harvest. I added a bag of turkey legs and wings along with a small chicken to a crockpot of “mixed poultry” tortilla soup. I threw in some of our frozen heirloom tomatoes zucchini and celery from last year’s garden and I had a satisfying meal grown mostly here at our farm, (minus the spices). It’s a good feeling. 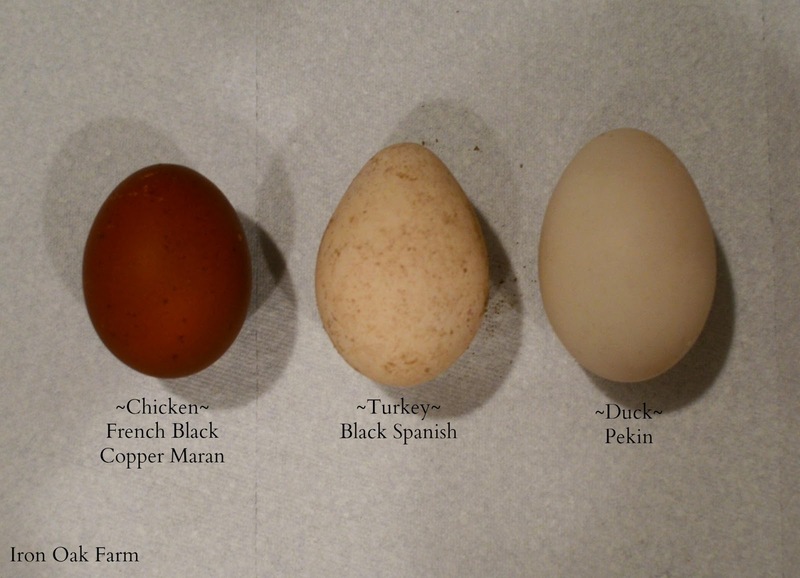 Our turkey eggs are slightly larger than some of our largest chicken eggs, but not as large as our duck eggs. Honestly, I would have guessed they’d be bigger. (Such a large bird compared to our ducks!) They are more pointed at the “pointed end” and the shell is a lovely creamy white with hints of peachy pink and brown speckles. 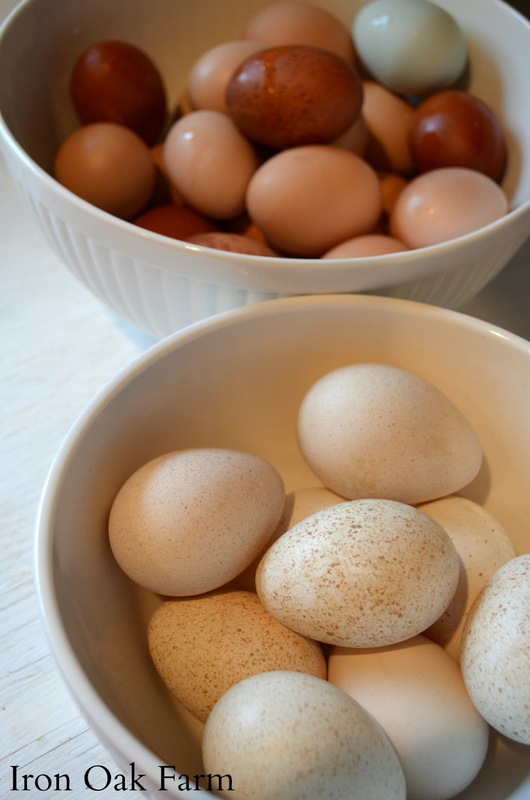 Turkey eggs are completely edible, and like duck eggs, are especially great for baking. The additional protein adds a dense texture to bake-goods. They are also higher in fat, calories and cholesterol. The turkey egg feels more dense to me. The shell is quite thick and difficult to crack. The membrane lining the inside of the shell requires a good deal more maneuvering to tear open the contents of the egg. I feel like turkey eggs would work really well for carving or other egg crafts that require a sturdy shell. 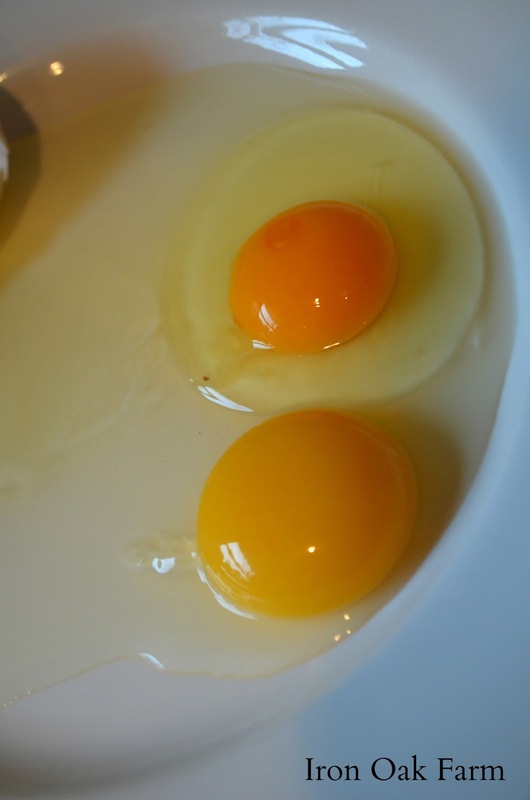 Here is a comparison of a Turkey egg yolk next to one of our large eggs. 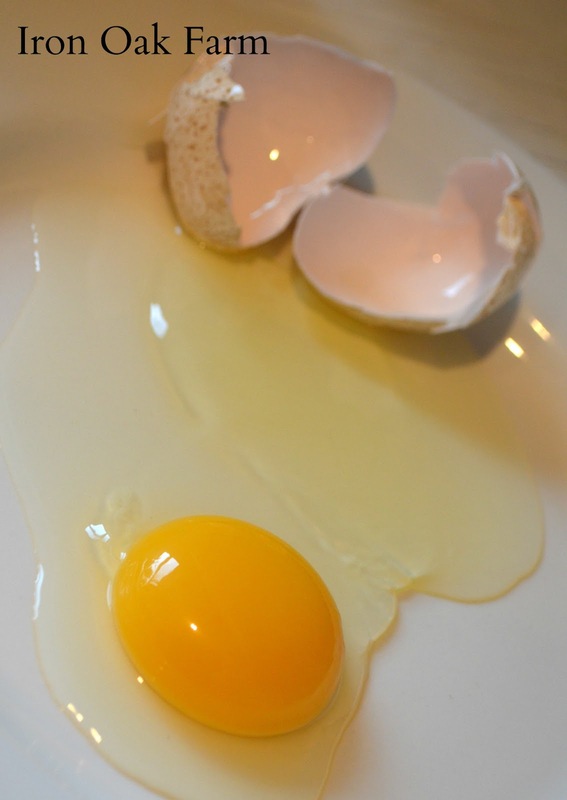 The yolk of the turkey egg was slightly more pale and more opaque or creamy looking. 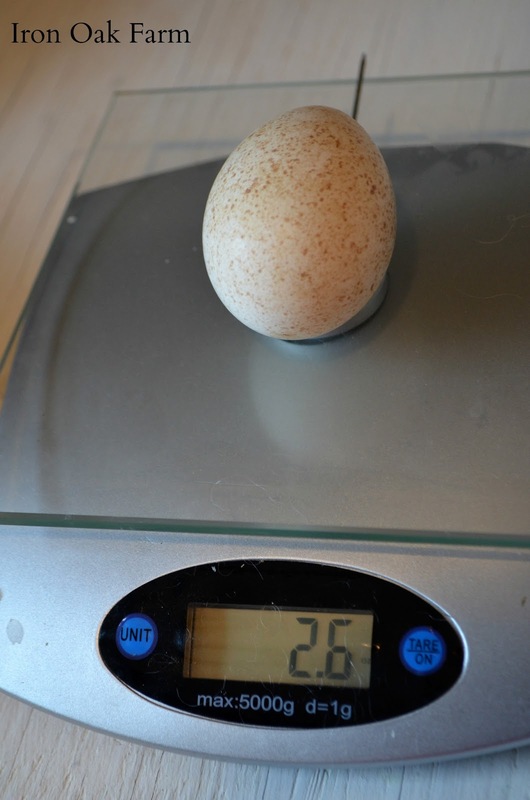 Most of our turkey eggs are weighing in between 2.5 and 2.8 oz. If you’re interested in eating a turkey egg, you might have to start a flock yourself, (which I highly recommend anyway). Turkey eggs are difficult to find in the general eating arena. You won’t find them in most grocery stores because factory birds are harvested before they lay their first egg and it costs more money to feed a turkey to laying age than it does a chicken. They are also not prolific layers, averaging 2 to 3 eggs a week. 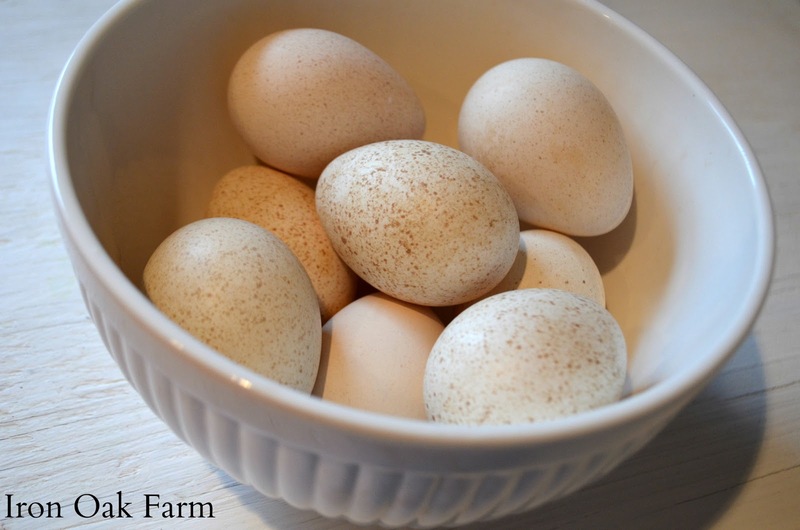 Most heritage breeders find that they can get more of a profit selling the eggs for hatching rather than cooking. In my opinion, the flavor of the meat is enough to always keep a flock of heritage turkeys…the eggs simply are an added interesting bonus! What’s the strangest egg you’ve ever eaten? I’ve heard of enormous Ostrich omelets at specialty diners. Tell us your strange egg story by leaving a comment below, or by visiting the Community Chickens Facebook Page.